A representation of the SAC-D spacecraft, which carried the Aquarius instrument. One of the most common questions I get (and the first comment to this blog) is “How do you measure ocean salinity from space?” During the SPURS-1 campaign in 2012 I wrote a blog post on this topic. Basically the story is one of building a very sensitive instrument (a radiometer) to detect subtle variations of L-band microwave emissions from the ocean. Aquarius, launched in June 2011 was designed specifically for that purpose. Unfortunately, the spacecraft on which the Aquarius instrument flew suffered an unrecoverable failure in spring of 2015. 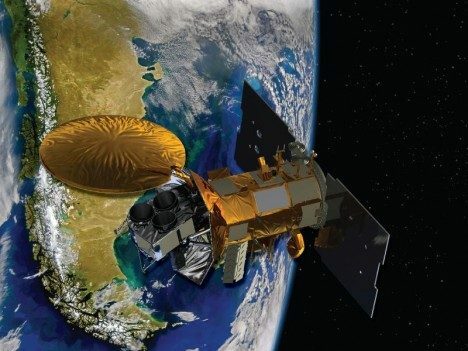 Fortunately for oceanography, NASA launched Soil Moisture Active-Passive mission (SMAP) in January 2015. SMAP uses similar technology (an L-band radiometer) to measure soil moisture. While SMAP is not as sensitive as Aquarius, NASA is successfully producing a salinity product from this mission’s data. The satellite missions detect only the salinity at the surface of the ocean. This tells us much about the exchanges of water with the atmosphere once we learn how to interpret the signals. The SPURS expeditions are all about learning how the surface salinity of the ocean changes so we can use the global surface salinity maps from space to diagnose matters of the water cycle over the ocean. The European Space Agency also launched the Soil Moisture and Ocean Salinity mission (SMOS). It uses a different technology (a synthetic aperture antenna array) to make the measurements, but also provides a salinity product we use daily. 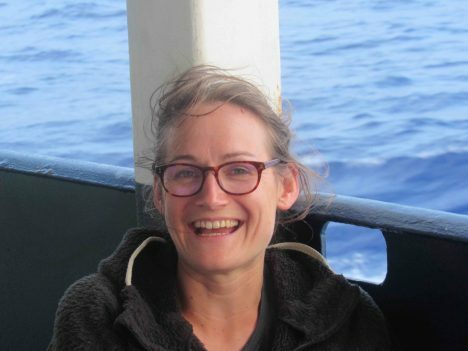 Audrey Hasson from the French space agency is aboard R/V Revelle and helping us bring all the space data (salinity, temperature, winds, sea height, waves) to the ship to guide our daily operations. Audrey Hasson, from the French space agency, aboard the R/V Revelle. 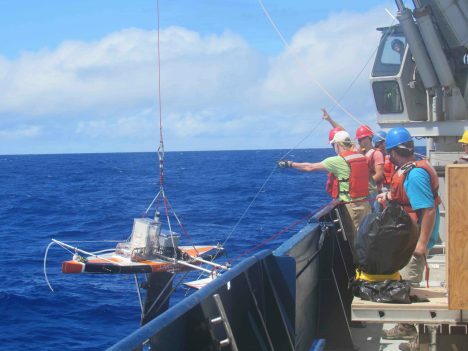 Most of the oceanographic work on this voyage is focused on measuring and understanding the variations of salinity in the top 10 meters (~30 feet) of the ocean. Here, in one of the rainier spots on the planet, rainwater freshens the surface ocean. The degree of freshening was not really appreciated until we saw the surface salinity from space. Measurements from ships and buoys usually miss sampling the upper few meters of the ocean because it is technically difficult to make those measurements. Taking full advantage of Aquarius and SMOS surface salinity observations has required a scientific revolution in measurement of salinity in the top 10 meters of the ocean. Getting back to shipboard life, I am happy to report that all the minor cases of seasickness are abating. Those that suffered from it are now smiling and eating. No serious cases of seasickness occurred at all, so my guess is that all the first-timers will return to sea in future! Deploying the Surface Salinity Profiler. Also, today was the first trial deployment of one of our key instruments, the Surface Salinity Profiler (SSP), from University of Washington Applied Physics Lab. It’s a salinity measurement “laboratory on a sailboard” that can be towed at outboard of the ship. 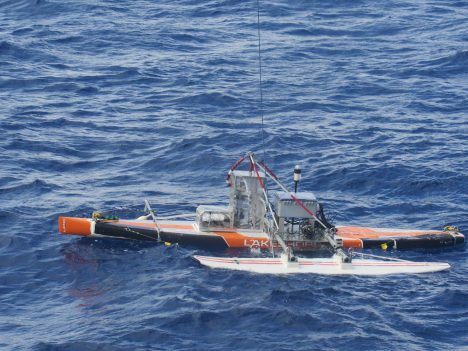 The instrument can measure salinity simultaneously and continuously at several shallow depths away from the ship’s influence and wake. The trial was devoted to the mechanics of deployment and recovery and the dynamics of towing the system. You will hear much more about SSP as the voyage progresses. Recovering the Surface Salinity Profiler. Winds dropped over night and whitecaps have largely disappeared. The sky is broken clouds with an occasional very light rain shower. Air temperature is 80°F. So overall, the weather conditions for test deployments off the ship are much better today! This entry was posted on Friday, August 19th, 2016 at 10:53 am and is filed under Salinity Processes in the Upper Ocean Regional Study (SPURS). You can follow any responses to this entry through the RSS 2.0 feed. Both comments and pings are currently closed.